Last week I performed my 4,000th IPL photofacial treatment. There are a lot of things I have learned from doing so many treatments. The IPL photofacial treatment can treat many signs of aging including dark spots, redness, broken capillaries, fine lines and wrinkles, enlarged pores, loose skin, and dullness. It can also treat almost any skin type, but the right settings must be used. I have learned that the Sciton Forever Young BBL IPL photofacial we use at A E Skin allows for specific adjustments in the settings which make it both safe and effective for many patients. The small spot adaptors help to target specific areas on the skin without affecting the surrounding skin. 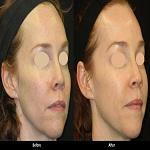 I have learned that an IPL photofacial does not need to be painful to be effective. At A E Skin we apply numbing cream (free of charge) and use cold air to keep our patients comfortable. When we ask our patients to rate their comfort level during the treatment on a scale of 0 to 10, with zero being no pain and 10 being the worst, the average person rates it 2 or 3. So much for no pain no gain. I have also learned that increased results are seen with more treatments. Most people do an initial series of three to six IPL photofacial treatments and we see from our photographs that people that do six treatments get better results than those that do three treatments. We also see that maintenance treatments every three months help protect our patients' investments and maintain their results. One of the most important things I have learned by doing thousands of treatments is that combining the Forever Young BBL IPL photofacial treatment with other treatments such as a Micro Laser Peel and Pro Fractional Therapy along with a good skin care regimen provides even better results. This is how I developed the A E Skin Soft and Smooth Rejuvenation treatment, the combination of a Forever Young BBL IPL photofacial and a Micro Laser Peel, which has become an increasingly popular treatment at A E Skin (review 1, review 2, review 3). I have also designed the A E Skin Ultimate Rejuvenation, which combines the Forever Young BBL IPL photofacial, a Micro Laser Peel, a Pro Fractional Therapy treatment, and an optional brightening step (review 1, review 2). Finally, I have learned to do the treatments quickly and efficiently. While the Forever Young BBL IPL photofacial treatment itself is very fast, treatments used to take five to ten minutes whereas now they average three to four treatments. Take a look at some of our own before and after pictures and read our reviews to see for yourself what kind of a difference an IPL photofacial treatment can make for you. Contact us to schedule a free consultation with Dr. Alex.